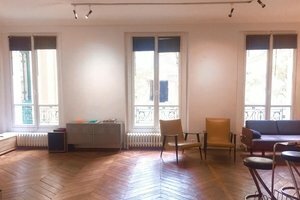 This elegant 130 sq m Haussmannian loft near Madeleine overlooks a lovely garden of 40 sq m and is perfect for Showrooms, Private Sales, Photo Shoots and Private Events. 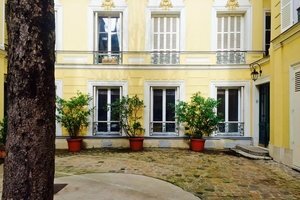 Nestled in a pretty Parisian cobbled courtyard, housed in a lovely yellow building, this mansion consists of five separate areas. The vast main room is instantaneously enchanting with its caramel parquet floors, white walls, and large French windows that overlook the garden. A marble fireplace, modern kitchen corner, lovely furniture, and reclining spotlights all add enviable touches. Adjacent to this is yet another room, adorned with designer sofas, shelving, and a desk space, ideal for a breakout space. 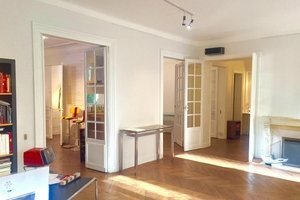 Located in the the affluent area of Madeleine, this impressive space is close to Rues de Miromesnil, du Faubourg Saint-Honoré and the iconic Hôtel Bristol.